3 Bedroom, 2 Baths With Lake View, Located On The Keuka Lake Wine Trail. Gorgeous 1870's stone house recently renovated and modernized while maintaining its historic feel. Surrounded by beautiful vineyards, professionally landscaped gardens, a petanque court (similar to Italian bocce), close to wineries, microbreweries, antique shopping, Keuka College. 2 Bedrooms furnished with king beds and fine linens. Beautiful bathrooms with a large pedestal soaking tub in addition to glass enclosed showers with European fixtures. New kitchen with nearly all new appliances and fully equipped for cooking/entertaining. A perfect wine country getaway for 2 - 4 people. Tranquil setting yet only 5 minutes to downtown Penn Yan for convenience. A complete guide to the area, restaurants, special events and even wine tour reservations are available for guests' convenience. My husband and I both grew up in Upstate New York and have been coming to the Finger Lakes Region of New York our whole lives. Penn Yan and Keuka Lake have special meaning to us as my husband's grand parents lived on the lake and he has many special memories. Our primary residence is in NJ so the charm and magical effect this area has on us never wears off! We have a lake-view family vacation home and property in the area. In addition, we have become wine grape growers on our land as well as own a small equestrian property nearby. We love the area and when this historic home became available, we jumped at the chance to invest in preserving this beautiful property for an additional 150 years! A beautiful and comfy home - everything was top notch! Want to keep this gem to myself! The house is wonderfully appointed and the grounds and multiple outdoor sitting areas are a bonus. The Stonehouse has three bedrooms, two with King beds across the upstairs hall from one another and one adjacent “child room” with twin bed and window seat. A very large bath, claw foot tub and separate shower, plus Washer and Dryer complete the upstairs. The staircase is a little steep as they can be in old homes. It appears the back deck and large sitting room with gas fireplace were added onto the original house. This was my favorite room. Plenty of seating room and beautifully decorated. Although I really loved the sitting room at the foot of the stairs with window seat too! Kitchen was well stocked and serving dishes galore in the dining room as well as ANOTHER sitting room next to that. Front porch sitting with view of Keuka Lake, Pom Pom Hydrangeas and other landscaping, English garden with fire pit and outdoor table and chairs made for a nice morning breakfast. There is also what I call a Zen meditation space next to the onsite grape vines, which BTW we had the delight to smell the Concord Grapes when we returned from dinner on Sunday night, Barn, Chicken Coop and more land. The “spooky” cellar I understand will be renovated to a wine cellar. I hope part of it will be accessible to renters when complete, OR VINEYARD VIEW Winery will be available to hire for tastings at the house, BONUS! Do not miss walking down the hill to Vineyard View Winery where some of the owner’s grapes are used to produce some of their wines. The caretaker of The Stonehouse, Annemarie, also works at the winery and was on duty the Monday we strolled in. So fun! Annemarie also told me the owner decorated herself. Her taste is impeccable. Very comfortable, relaxing, quiet. Perfect! This house is a true gem! No boxes are left unchecked at this stunning property. Upon arrival, the property itself is absolutely beautifully landscaped. The house oozes charm and character from the beautiful stonework and porches. Inside every detail nods to the period and character of the time the house was built. We enjoyed the huge family room as a gathering place. The other sitting rooms were great places to sit and read. The kitchen had everything we could possibly need. The furnishings and linens are of wonderful taste and quality. This house is a gem. 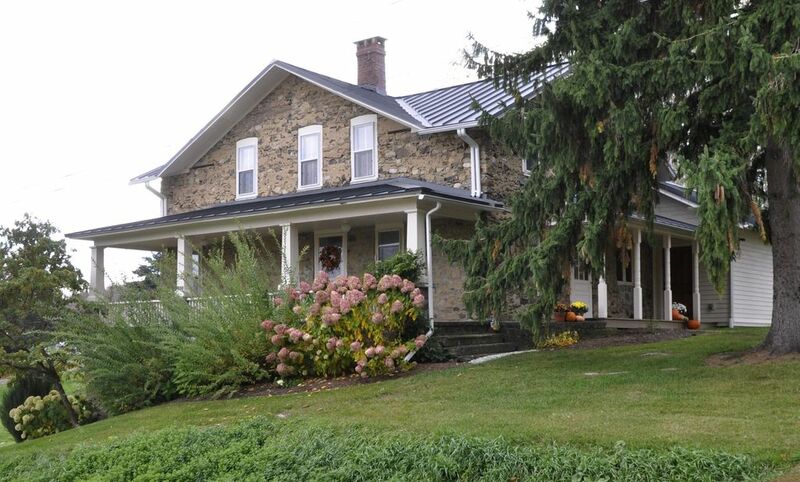 We are so glad this is the house we selected to enjoy our vacation to the Finger Lakes. Thank you so much for your glowing review! It is what we are striving for as an experience for our guests. It is a special place for those that appreciate its old stone farmhouse charm, yet all the luxury adds to make our guests comfortable! We ( four) adults were delighted to find our very first VRBO house was all we expected and more! The Stonehouse was a perfect retreat to relax and enjoy friends, a great view and delicious wine. The house was everything advertised and more. It was bigger and better than we expected. It was sparkly clean and had everything you could possibly need for any length stay. We traveled around the porches at different times of the day to enjoy the view. Comfortable, clean and well situated in wine country it was a perfect retreat for anyone. The owner had been attentive and responsive in communicating with us. There are wonderful home managers nearby who were available to help us with whatever we needed. Best house ever if you’re considering the finger lakes region and I highly recommend this property. Thank you so much for your glowing review! It makes everything worthwhile when guests enjoy their stay in the magical Keuka Lake area and our special stone farmhouse! Beautiful home and perfectly located. Taxes required: 8% NY State sales tax plus 4% Yates Cty Occupancy Tax Flat rate $125 cleaning fee collected.